BitTorrent Sync, a free to use (but not open source) tool that can be used to automatically synchronize files between computers using the BitTorrent protocol, is now available for all as public alpha. The application runs on Linux, Windows, Mac OS X and NAS. The tool, which has been in closed alpha for the past four months, is advertised as "a simple tool that applies p2p protocol for direct live folder sync with maximum security, network speed and storage capacity". 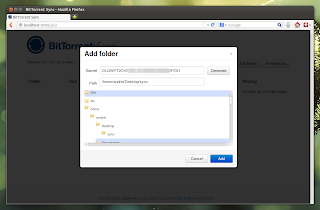 And indeed, BitTorrent Sync is a great way of syncing and sharing files between computers, even files that you usually wouldn't trust with cloud sync tools such as Dropbox: besides the files being transferred directly between the users (so your files don't end up on some cloud server), the connection is encrypted with a AES cypher and a 256-bit key created on the base of your Secret, a random 20 byte or more string. For increased security, there's also an option to generate a Secret that expires after a day. Basically, this peer-to-peer (p2p) sync tool can be compared with cloud sync services such as Dropbox or Ubuntu One, but no server is involved which also means that the sync can be faster than such services and there are no space restrictions (except your HDD). This also means the computers need to be online for the sync to work, obviously. Arch Linux users can install BitTorrent Sync via AUR. If you want to connect to other devices / synchronize a folder from a remote computer on your machine, follow the same steps as above, but instead of clicking "Generate" for the Secret, paste the Secret generated for the folder from the remote computer. For more on how to use BitTorrent Sync on Linux but also on Windows and Mac OS X, see the User Guide PDF file. Download BitTorrent Sync for Linux, Windows, Mac OS X and NAS.